So many people coming to Mallorca in search of a seaview property are surprised not be overwhelmed by choice. After all, with an area of 1,416 sq miles, the island is more than twice the size of Greater London, with its 32 boroughs, and 345 miles of coastline. However, only 21% of the land has urban classification. The rest of its perimeter comprises land designated as rústica where building regulations require a minimum plot size (15,000 square metres and upwards), national parks, protected areas of outstanding natural beauty and a few strategic military zones. In 2007, directives from the Department of the Environment in Madrid resulted in restrictions on the creation of further coastal urbanisations, notably, in Cala Blanca (near Puerto Andratx), Muleta (Puerto Sóller) and Cala Carbo (Pollensa). Since then, the authorities in Mallorca have been re-measuring and re-defining the coastline. The work should be completed by the end of this year. While there has definitely been some readjustment towards more realistic pricing in the past twelve months, any property where demand outstrips supply will command its price and unrestricted sea views can be costly – costlier still if there is also direct access to the water. Agent descriptions will often cite “sea access” but in many cases, where steps have been cut from the rocks (no longer allowed), they will end abruptly and you will be faced with jumping in from five metres or more, with no way of getting out again. This dramatic coastline provides spectacular views and sunsets. However, if you look at a relief map you will appreciate why there are only 5 locations where you will find properties with sea views. The Tramuntana mountain range runs the entire length of its north western side, rendering 50% inaccessible, from Puerto Sóller (the only safe haven midway along that stretch) to the plains of Pollensa. • Banyalbufar, a small hamlet spread over a multitude of terraces, is very picturesque if you can bear the tortuous road – Richard Branson, former owner of La Residencia hotel, bought an estate nearby hoping to create the new Deiá but gave up due to planning problems. A 4-bedroom villa with splendid pool terrace and views over the whole village and out to sea is on the market for €1.9m. • Valldemossa, nestled between the mountains, faces towards the city of Palma, which is only 15 minutes drive. Just 3km away lies the quiet residential area of George Sands – sea views can sometimes be obscured by the local sea mists. 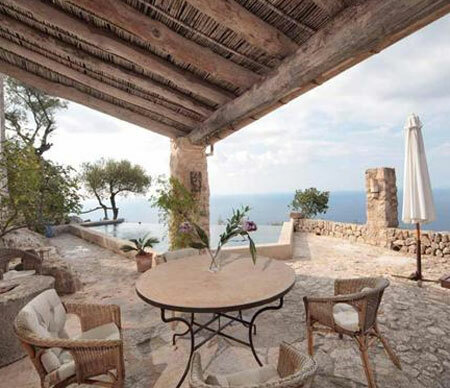 A 3-bedroom, 3 bathroom, stone faced property on a 1200 sq m plot with stunning views is asking €1.8m. • Puerto Sóller has been steadily undergoing improvements to the seafront and with the opening of a by-pass tunnel is virtually traffic free apart from the 1912, wooden sided tram which runs from Sóller town to the port. The marina has been redesigned, the fishing fleet repositioned and the beach remodelled. The Jumeriah hotel project has stalled temporarily but when complete will provide 120 suites with incomparable sea views, hanging over the cliff edge. As an example of how the coastal authorities are exercising their powers, the first private landowner in Sóller municipality was recently fined €18,000 for erecting a wire fence and posts which prevented access for walkers to the coastal footpath between Alconasser and Bens D’Avall, a small urbanisation eight minutes drive west of Sóller town, which has since been re-zoned so that building is no longer permitted on remaining plots. Towering above Bens D’Avall, an area known as Sa Muleta boasts a magnificent, newly constructed, stone faced property in an elevated position with unrivalled sea views, asking €8.5m. With land of 50,000 sq metres, this private finca has spacious, light filled rooms and a landscaped, infinity pool. To the north west of the port in the hills of Sa Figuera, there are some substantial stone properties with distant panoramic views of the harbour. A five bedroom, completely renovated, character finca with decked pool and 17,400 sq metres of land is on the market for €3.5m. • Formentor, the peninsula in the far north, is ten minutes’ drive from Pollensa port. Its famous, seafront hotel sits in what some consider the best grounds and gardens of the entire island. One of the few properties left for sale with direct access to the sea and its own dock is for sale asking €10m. It needs some renovation, but its location is first class, with breathtaking views over crystal clear waters. * How is the property market on the Balearic Islands faring?